Africa host ones of the most amazing countries, one of the less known by tourism: Zambia. This expedition will mainly focus around the Zambezi River and its wonders, from the extreme east of the country to extreme west; this area is one of the least visited in the country. The Zambezi is the fourth longest river in Africa. It flows through six countries on its journey from its source in northwestern Zambia to the Indian Ocean, an amazing 2.700 km. This river evokes mystery and excitement with few rivers in the world remaining as pristine or as little explored. Apart of the natural wonders of well-known Victoria Falls, the Zambezi host secrets that are worth to be explored. The Luangwa river, its main affluent, digs an amazing Valley, an extension of the Great East African Rift Valley, is the honey-pot of Zambia. Here dramatic seasonal variations, a dynamic river system, fertile soils and lush vegetation ensure a prolific supply of wildlife. 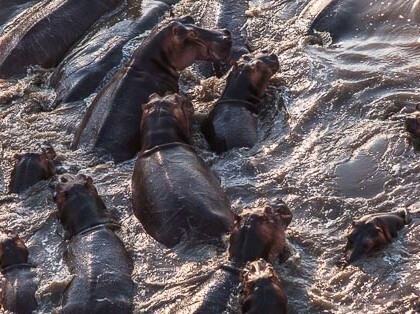 An impressive concentration of both hippos and crocodiles makes the Luangwa River one of the most densely populated in Africa. 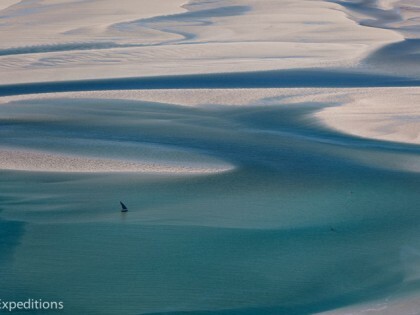 The expedition focus the wild african waters of the region and the amazing exploration potential offerred by paramotors. Using 4×4, canoes and rafts to access the remotest spots of the rivers, the experience is unique, bringing the real “Livingstone feeling” as an essence of the trip. 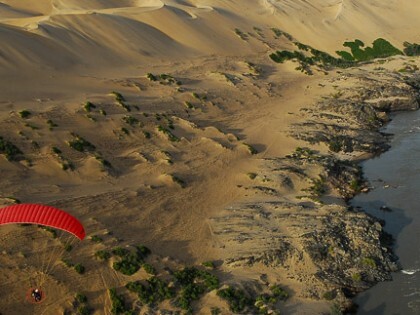 Explore the most remote and exclusive wilderness of Zambia with your paramotor. Do your introduction flights in Kasanka, a fantastic protected area, where the world biggest bats migration takes place counting over 10 millions mammals. 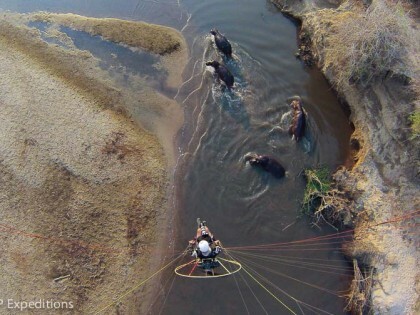 Explore the wild Luangwa River from the sky, and deal with the amazing wildlife density. Discovers Kafue reserve at the amazing Mukambi plains. Be one of the few flying over the Ngonye falls, the unknown fantastic waterfalls of the Zambezi. 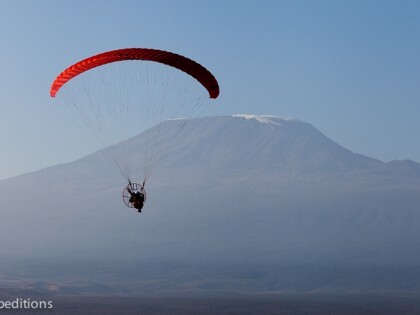 Do an unbelievable Paramotor Safari in Liuwa plains, where a major Wildebeest migration takes place. End your expedition at Victoria Falls, where you can raft the Zambezi in its world-class rapids. Arrival at Lusaka Intl. Airport. Transfer to Hotel in town. 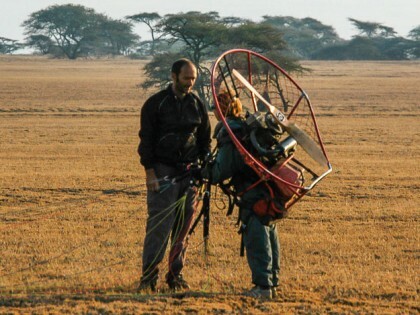 We will set up the paramotors, preparing for your first Zambia flight. First briefing will be given, while having a nice dinner together. We will drive 500km to a very special place, in Kasanka National Park, where we have special authorizations. There is a lot of Wildlife around, and this is a perfect place to do the first flights. After preparing our flying equipment and the first briefing, if the winds allow us, we will do the first flight for one hour before dawn. Terrain is easy to take off with clean stone/bush-free ground. Altitude is 3000ft/1000m. Nice evening and dinner by the campsite. There is optional air charter to avoid the driving. See page the Optionals page for more info. Flight by 6:00 am with an amazing quantity of wildlife, particularly antelopes, no lions here, but elephants are part of the program. 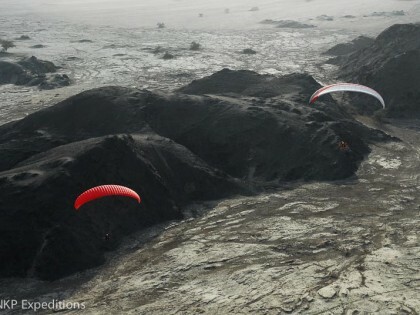 The place is technically easy to take off, with lot of space, few obstacles. We will stay in the area, relax and enjoy the wild the rest of the day, waiting for the evening to be able to fly again. We will take off at around 6:00 am for the morning flight and will leave the camp after breakfast, when the staff has packed all the equipment while we are flying. We will head to North Luangwa, and reach after a rough day on the road an incredible secluded camp run by Spanish friends, set by the beautiful Luangwa River. We will stay at the camp and do eventually an afternoon flight. Lots of lions will be heard at night. Here we will have a serious briefing on wildlife and security before the next morning flight. We will stay 3 nights in this unbelievable place, enjoying every minute. Morning flights at 6:00 am, following the river over the hippos, crocodiles and over sandbanks. 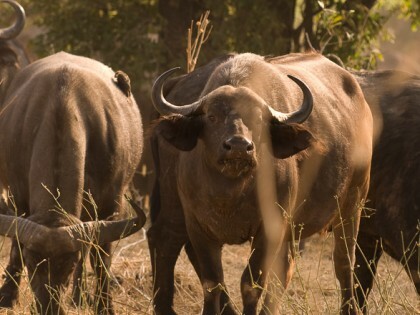 Huge herds of buffalos, another specialty of this part of the Luangwa. The river offers easy take off areas, allowing pilots to take off from wide sandbanks. We will go around a Rhino sanctuary, located in the area, where visitors are not normally allowed. After the morning flight, we will take the Air charter to Mokambi plains, in the fantastic Kafue valley, where we have special authorizations to fly. We will stay at the Mokambi plains camp, close from the beautiful Kafue River. Eventually we will make an evening flight if winds allows. Morning flight over the Mokambi plains, and relax at the camp during the day. Nice lunch, and evening flight, or a game drive if weather does not allow us to fly. Morning flight above the Kafue River, and we will leave the camp after breakfast, when the staff has packed all the equipment while we are flying. We will head to Mongu by road and camp close to the Zambezi River; we will eventually visit the local and friendly Lozi people. Morning flight above the Zambezi and the Bulozi plains. After breakfast, and after crossing the Zambezi (dry season only!) we will reach the remote village of Kalabo, where we will take an armed ranger. After crossing a manually operated pontoon, we will head to Liuwa plains .The game is spread out across the plains and takes some driving around to find, but to come upon a vast herd of blue wildebeest, a prowling wild dog, or a pride of dozing lions in this forgotten piece of Africa is especially fitting because of its completely natural and un-commercialised state. This is home of a Serengeti-like big wildlife migration, and we will try to witness it from the air. We will camp in the bush and prepare an evening flight above the great plains. We will stay 2 days in the Liuwa Plains to be able to explore by air the beautiful endless grassland crowded by thousands of wildebeest, zebras and we will try spotting predators from the air. We will keep flying here, enjoying the endless possibilities of this absolutely amazing place, and afterwards relax and enjoy the wild the rest of the day, waiting for the evening to fly again. We must fill up the water tanks, as this is the only point we can source it for the next 800 Km. 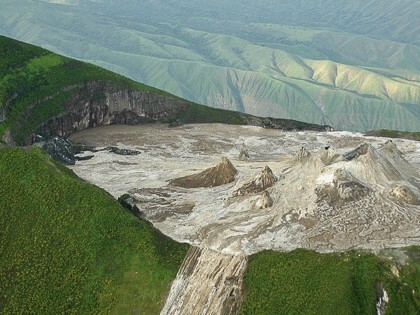 The last flight of the expedition: Early Morning flight above the Amazing Ngonye Falls! And after breakfast we will drive to Livingstone and stop at the chosen hotel; end of the expedition, where we reach the civilization and enjoy a good dinner. Optional activities in Livingstone: White Water rafting on the class 5 rapids; Bungee jumping over the bridge; helicopter flips over the Zambezi. Evening at the hotel and last dinner.